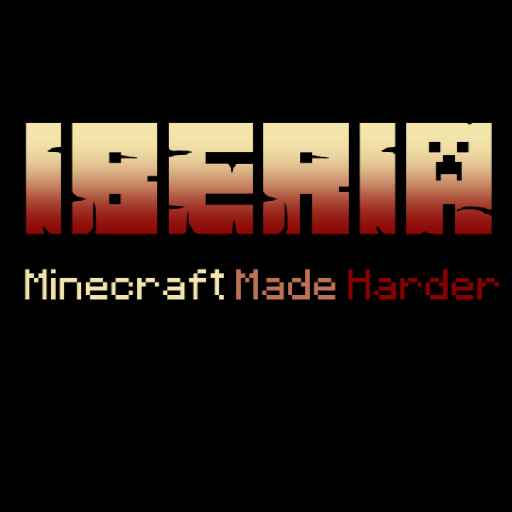 The philosophy of Iberia is to make Minecraft harder in ways that respect the vanilla Minecraft experience, enhance gameplay, encourage more experiences that are available in the game, and add a dose of reality. Could you enhance upon the spawn system? Instead of respawning relative to your last spawn point could you make it relative to where you died? As well as allowing us to configure the distance from that point. That way I could say for example respawn 500 blocks from where I just died. I'll consider adding that the next time I come back to work on the project. No need to, just use Iberia, and disable the other features in config. Wanted to post about a slight issue with the sleeping mechanic. I cannot seem to get it to function correctly, as in I always "wake up to the sound of moaning" no matter what. In the config I tried putting the chances of that happening all to 0% but it still happened no matter what, even with a fully concealed and protected area, all lit up with a huge roof over my head, so I'm not sure what's happening or if other mods I have could potentially be breaking this though I wouldn't see how so. Is this any sort of known issue? What practical effects does the hardened stone mechanic have on Minecraft, processing- and performance-wise? I'm really tempted to use it on my modpack, but I understand it's not really intended for use with modded Minecraft. Does it have the potential to create lots of lag if lots of players are digging at once? Is it likely to cause issues with anything in other mods? Does it significantly increase the filesize of world saves, or increase packet size to any noticeable degree? Sorry if this sounds like an interrogation, haha! I'm interested in the mechanics more than anything else but trying to make a sensible decision for my players also. No worries, happy to answer, as best I can. It definitely has an impact on performance, mostly in terms of tick rate. It can also slow down initial chunk generation a bit. I admit that I haven't done much testing of this, so I can't quantify exactly how much slowdown there is. But for me, I got it to a point where it wasn't noticeable when playing single player. I've also played a little with my three other friends, and it didn't seem to cause issues. We just had Iberia and Quark for mods, so I can't really say how well it would do with lots of other mods. There should be no real impact on file sizes of world saves, or packet increase. Having lots of players digging shouldn't affect the tick rate much either, it's largely going to be dependent on how much stone there is in loaded chunks. Of course, that's a lot for a typical world, but again, I felt like performance was adequate in the scenarios I gave above. In terms of compatibility with other mods, I will say that hardened stone only works for the default minecraft stone blocks, and not for any modded blocks that should be treated like stone (i.e. Quark's limestone or marble). I suspected as much - most people's computers now can handle extended-vanilla modpacks with no issues so any performance issues would be least likely to crop up there. I think I like the feature enough that I am going to give it a try and see if it causes problems - but this leads me to another question. If I remove the mod from my world, how will this impact the world? Will it remove all blocks from the world that are hardened stone and leave large chunks missing out of the underground? If so, could I get around this by disabling the feature and loading the world? If so, would I only save loaded areas of the world this way (areas that had had a chance to load in and have the hardened stone revert back to stone)? No, once you've generated chunks with the hardened stone blocks, you'll need the mod or things will break. Badly. Just a fact of life when you use mods to add blocks to the game. No way around it unless there is something fancy you can do with world edit, but that's beyond my knowledge. Is a port to the new Rift modding API (Minecraft 1.13) worth a consideration? Its awsome and lightweight! I think it would fit Iberia better. Also, I think that diamond pickaxes shouldn't ignore compressed stone. Im ok if golden pickaxes can do this, but diamond pickaxes are tools you carry around all day, even early game. This makes this whole mechanic unnoticeable, because nobody uses iron pickaxes if they can use diamond pickaxes instead and golden pickaxes would actually become useful. Yeah, it can already be configured, so it's really up to the player/mod pack creator. A big part of Iberia's purpose is to extend the early game, so it does take a bit longer to get to diamond tools. As for porting to Rift, it sounds intriguing, but I bet it won't have the necessary hooks to do everything Iberia does. That said, I'll take a closer look when I get around to porting Iberia to 1.13.
what happened to version 2.0-24? It looks like it just got skipped. I got some changes from a contributor that bumped the version to 2.0-25 and didn't notice that it skipped 2.0-24.
i love the sleep system of this mod! will you update to 1.12? I assume I'm missing something here because the rock-challenge part of your mod does not run properly for me, but there are no bug reports on the matter. I tried it first on my self-hosted minecraft server (where I play with friends) and the behavior was as I proceed to describe: rock was turning to hardened rock much faster then expected from the description and the videos I found; more importantly, tying to break a hardened rock with a wooden or stone pickaxe (we didn't try other materials) resulted in a perfectly normal break-time (so very short compared to what it shuld be! ), but after the block breaked graphically, it actually reappeared, only to go away for real after a handful of seconds; in other words, it behaved like the mod wasn't there (fast breaking time) and the server lagged dramatically (it didn't, this happened only with every piece of hardened rock from your mod). So a few hours ago, I decided to try the mod out in singleplayer for test purposes. On a neww singleplayer game on my machine, it behaves differently, but still not as expected: hard rock is not harder to break at all (just like on the server); there is no "lag-like" behavior, but it's like the mod isn't there (the other challenges work perfectly fine). On top of that, I installed Waila, and I can tell you that the hardened rock blocks are shown as "AIR - ERROR". What might I be messing up?